I WAS RETURNING from an expedition to the Pont Marie, one of the oldest bridges in Paris, where I had been on my feet for a little over three hours collecting material for my Paris Bridges Project. It was a sultry afternoon, I was tired and in need of a sit down and some refreshment. I was heading for a café I often frequent when I’m in these parts when I happened upon a short, narrow, medieval Parisian street I’ve walked along many times but never really stopped to take much notice of, rue du Grenier sur l’Eau. For the first time, I was intrigued by this street so I paused to absorb the atmosphere. The street runs parallel to la Seine and it’s bordered to the east by the rue du Pont Louis-Philippe and by the rue des Barres to the west with the Êglise Saint-Gervais-Saint-Protais de Paris just beyond. 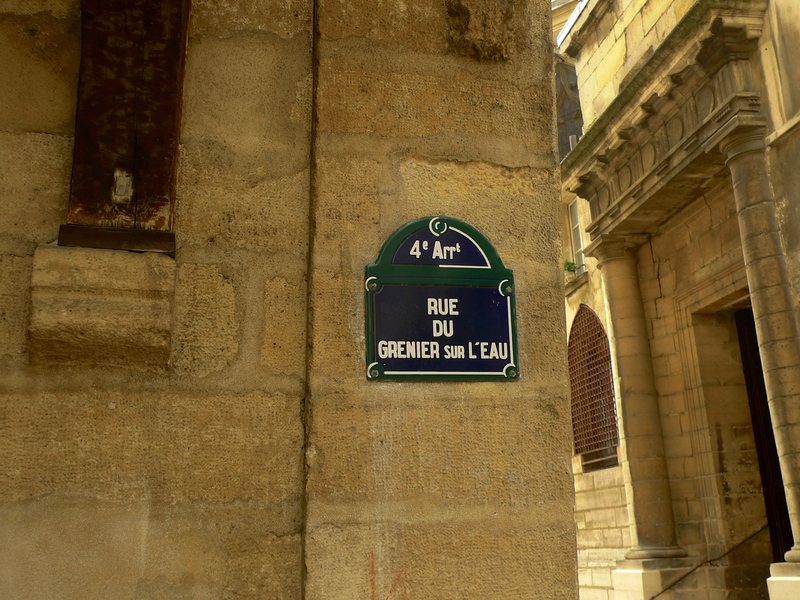 As I’ve said, rue du Grenier sur l’Eau is a short, narrow, medieval street and I was particularly intrigued by its name. In French, the word ‘grenier’ means attic or loft so to my mind, “street of the loft on the water” didn’t seem to make much sense. All became clear though when I got home and consulted my bible on these matters, Bernard Stéphane’s ‘Dictionnaire des Noms de Rues’. 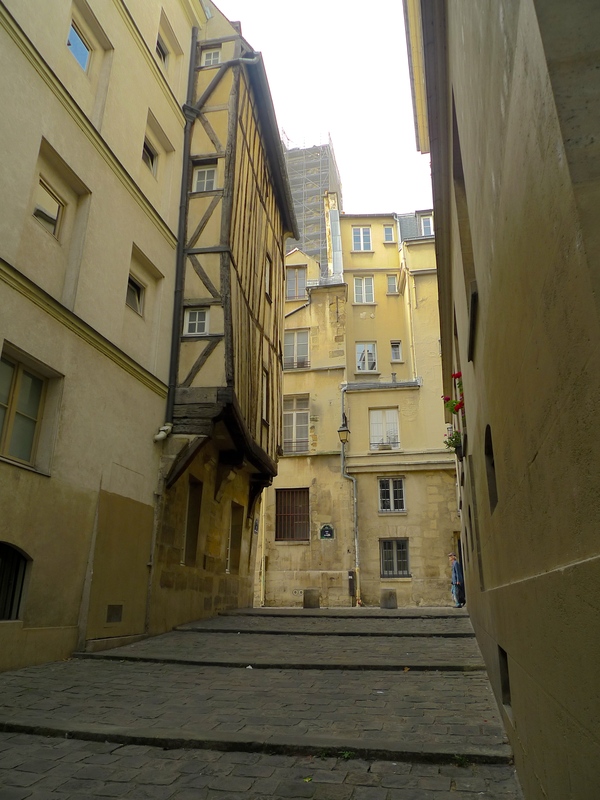 It seems that in the early thirteenth-century, a Monsieur Garnier or Guernier owned some houses in the passage between the Êglise Saint-Gervais and the river. In 1241, all of these houses were acquired by the Knights Templar save for one in which Garnier’s goddaughter lived. The records show that in 1257 the street was known as rue André-sur-l’Eau but by 1391 it had become rue du Garnier-sur-l’Eau. It seems then that the present day rue du Grenier sur l’Eau is a corruption of the fourteenth-century name, rue du Garnier sur l’Eau. So nothing at all to do with attics or lofts then! Not only was I intrigued with the name of the street, I was also intrigued by its atmosphere. When I arrived, the street was practically empty save for the occasional passers-by pausing to look at the shop at the bottom of the street. Apart from the shop, the only one in the street, and the occasional traffic passing along the rue du Pont Louis-Philippe the street had a very medieval feel to it. I was also keen to explore the sound tapestry of the street. 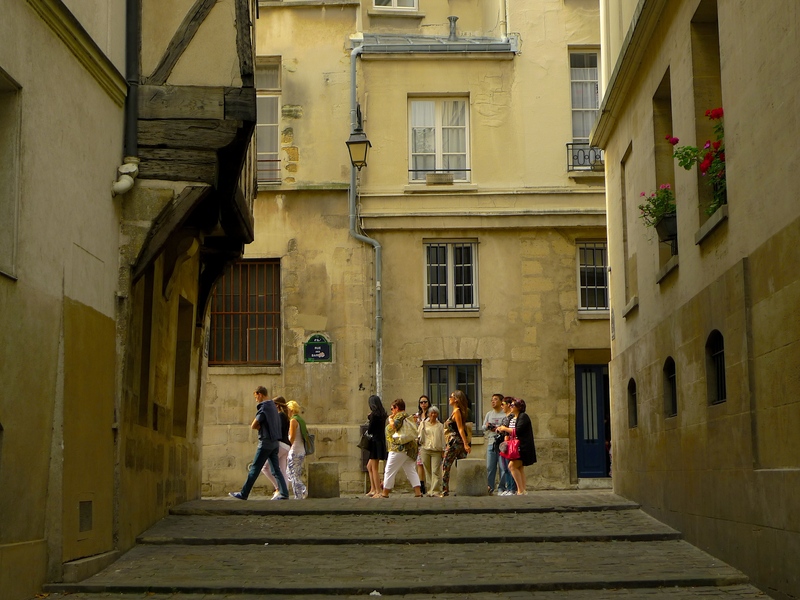 After all, quiet streets in Paris are relatively rare things. 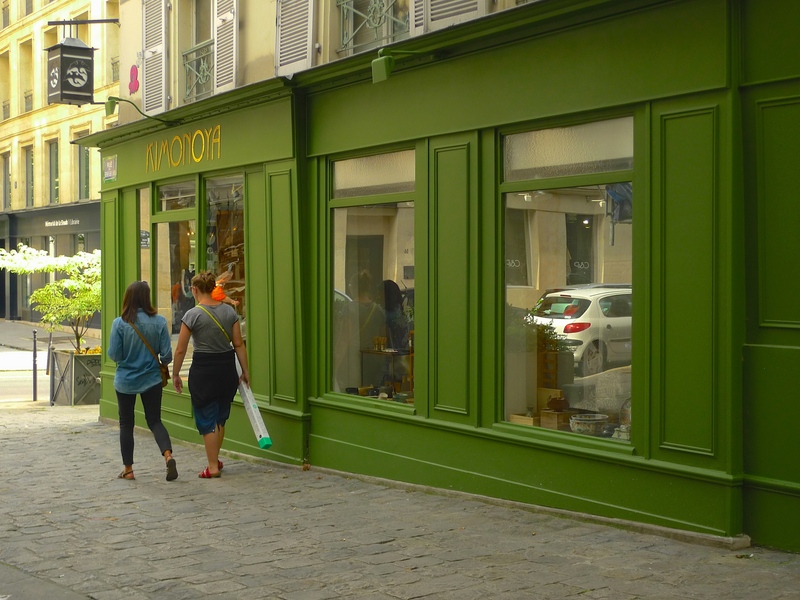 Those of you who follow this Blog regularly will know that I often use the technique of soundwalking to explore the city’s sound tapestry but the rue du Grenier sur l’Eau is not a street that lends itself to soundwalking. It’s a short street and it takes no more than a minute to walk from one end to the other. In my experience, the best way to capture the sound tapestry of a street like this is to do the reverse of a soundwalk, that is to say, stay in one place and let the street walk past you. And that’s exactly what I did. 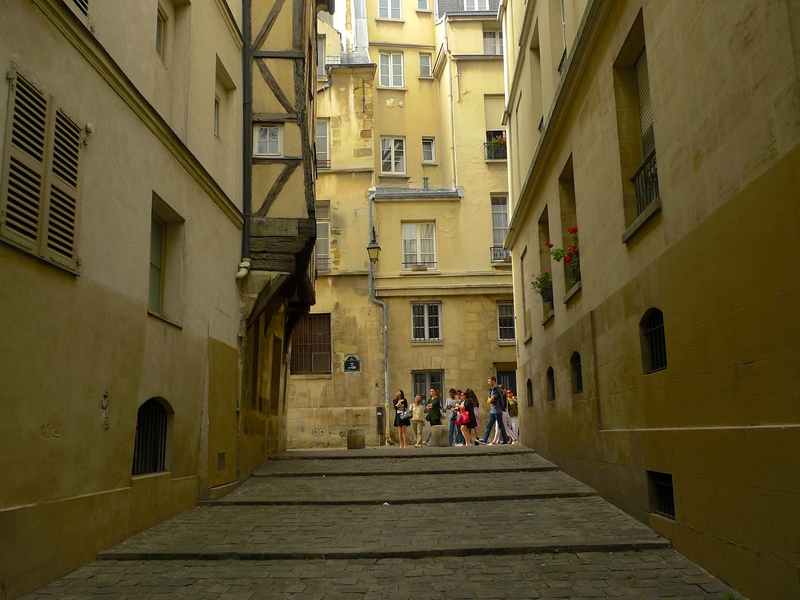 I positioned myself in the narrowest part of the street, about two-thirds of the way up towards rue des Barres, and from there I began to record and to see what would happen. As is so often the case, things seldom turn out the way one expects. My microphones revealed that, what appeared to be a quiet, medieval street was in fact a hive of sonic activity. Ordinary Parisians passing by, some chatting to friends, some purposefully walking from one place to another, some carrying their shopping and looking rather weary and some simply strolling and enjoying the sunshine. Small children gambolling within sight of but not tied to their parents and testosterone-fuelled adolescents jockeying for position in life’s pecking order. And then there were the tourists, mostly in groups, receiving yet another commentary about yet another ‘site of interest’. The sounds of voices, footsteps, children running, a car horn, things falling over, a breathless jogger and rustling shopping bags were all now evident whereas they had been inaudible from further down the street. A bicycle rickshaw rattled past with the driver giving a fleeting commentary on the architecture. And another, more detailed, commentary came from an English-speaking French tour guide who was escorting a small party of Japanese tourists. This commentary is actually worth listening to in some detail. The tour guide was talking about this timber-framed house. He tells us, or rather he was telling his tour party, that all the houses in Paris were like this until the seventeenth-century. Wood floating down the river was retrieved and used either as firewood or to make timber frames for the houses. The problem was that, because the streets were very narrow, a fire in one house could easily leap across and set fire to the neighbouring houses. To avoid this hazard, a law was issued around 1600 saying that the wood had to be covered with plaster. It’s only in recent years that some of the plaster has been removed to expose the wood. 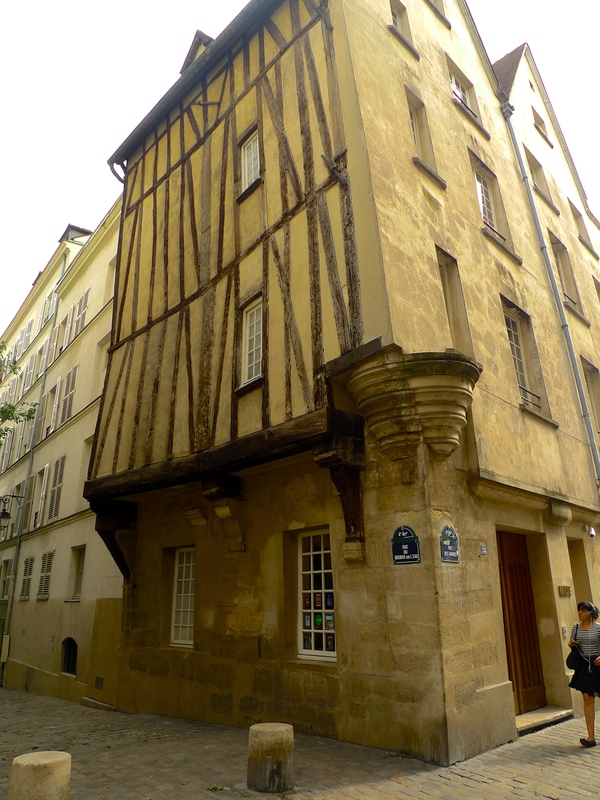 In the picture above you can see that the timber frame is exposed on the rue du Grenier sur l’Eau side of the house but the plaster remains on the rue des Barres side. This house is now a youth hostel but it’s so popular, especially in the summer, that guests are only allowed to stay for three nights. I’m not quite sure how much of all this was absorbed by the Japanese tourists but it fascinated me! 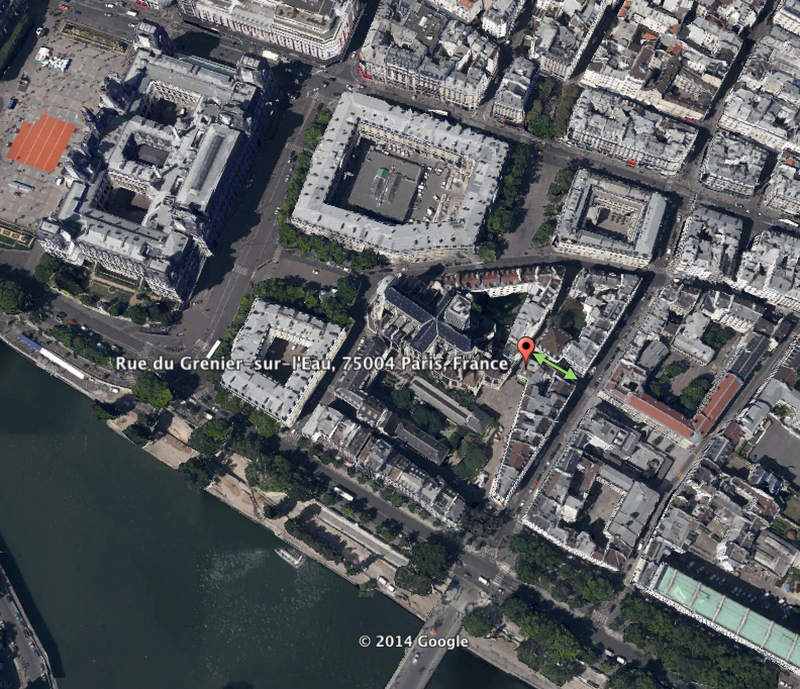 I spent well over an hour standing in rue du Grenier sur l’Eau observing, but observing through active listening. I suspect that most of the people who passed by were aware to some extent of the soundscape around them but probably only as something in the distant background. For those engaged in conversation, these ‘background’ sounds would probably have passed by largely unnoticed. For me though, the rue du Grenier sur l’Eau, small as it is, seemed to be huge canvas upon which was woven a colourful and captivating sonic tapestry depicting the fascinating contemporary atmosphere of this medieval street.